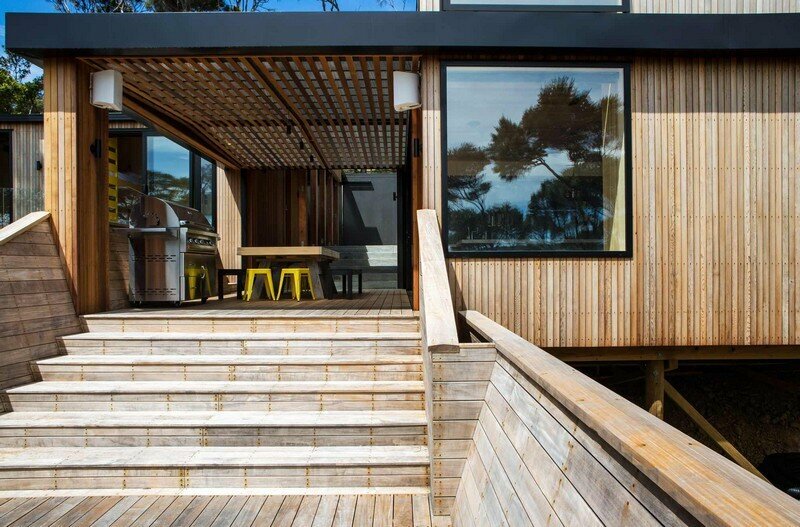 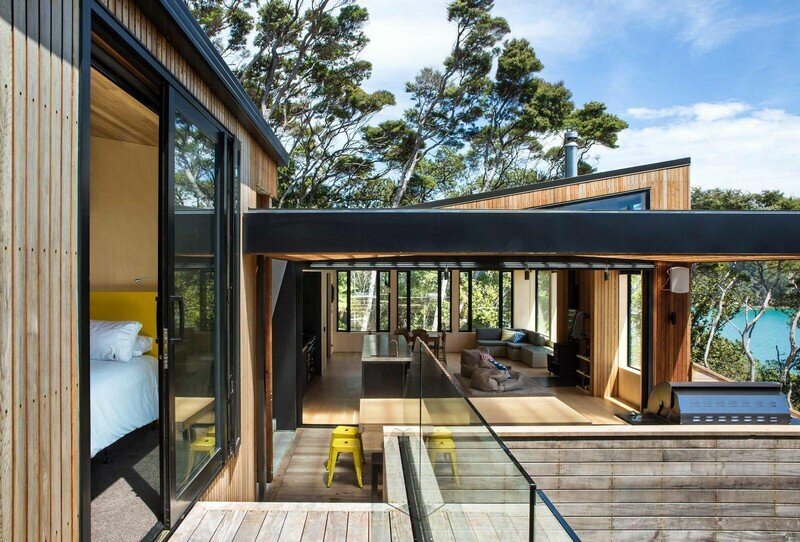 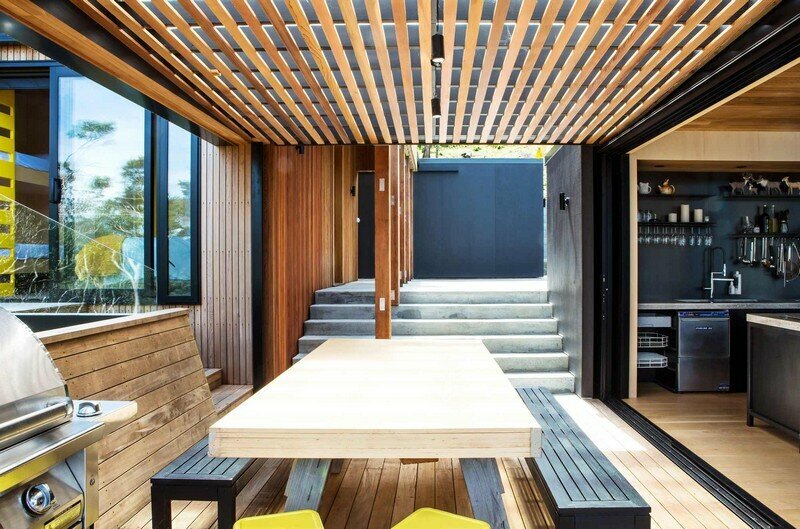 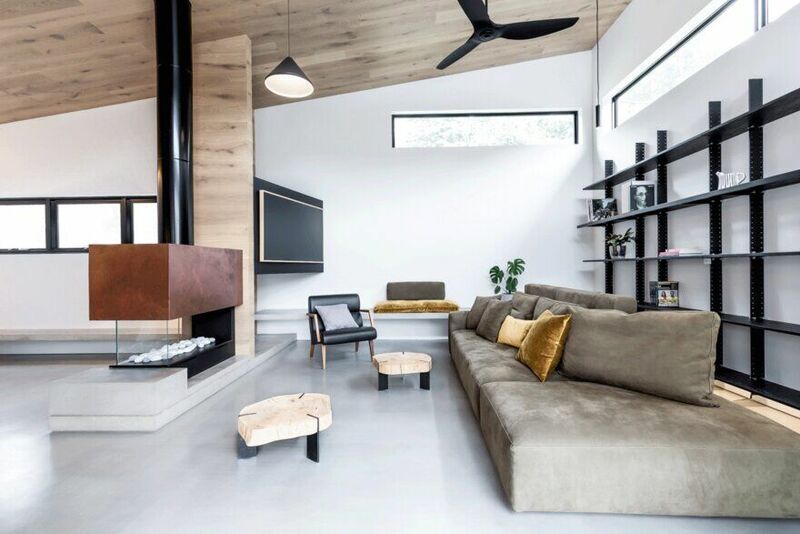 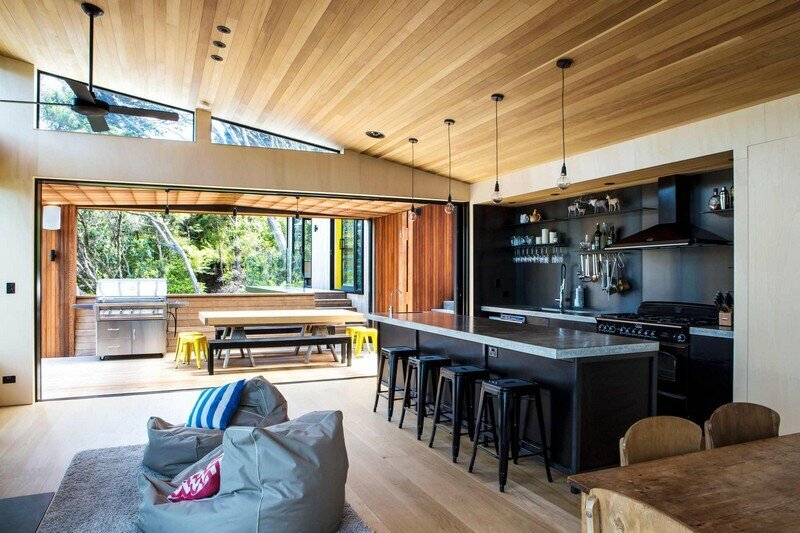 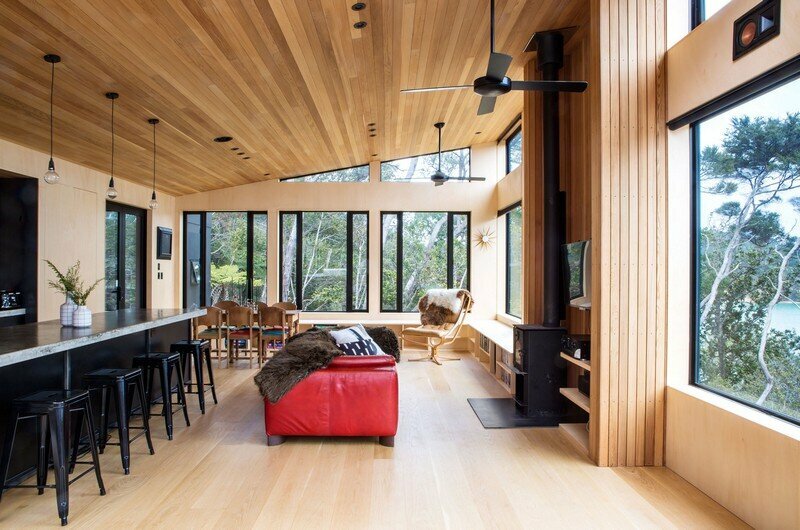 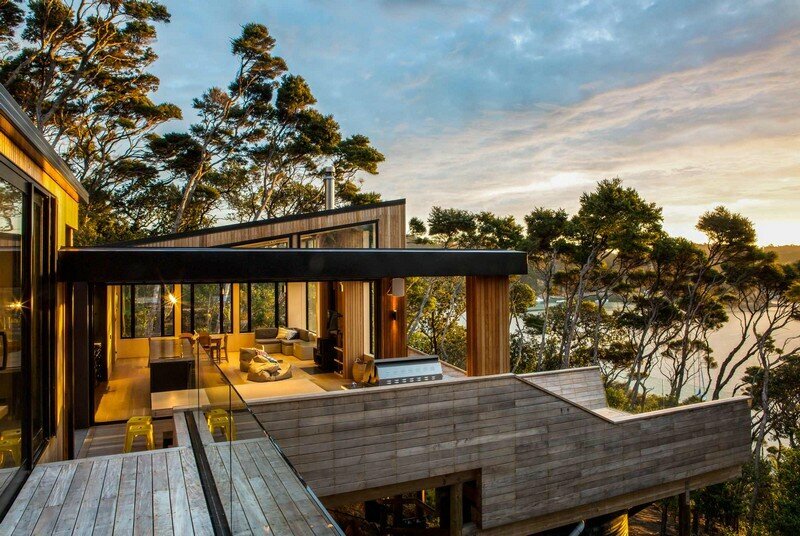 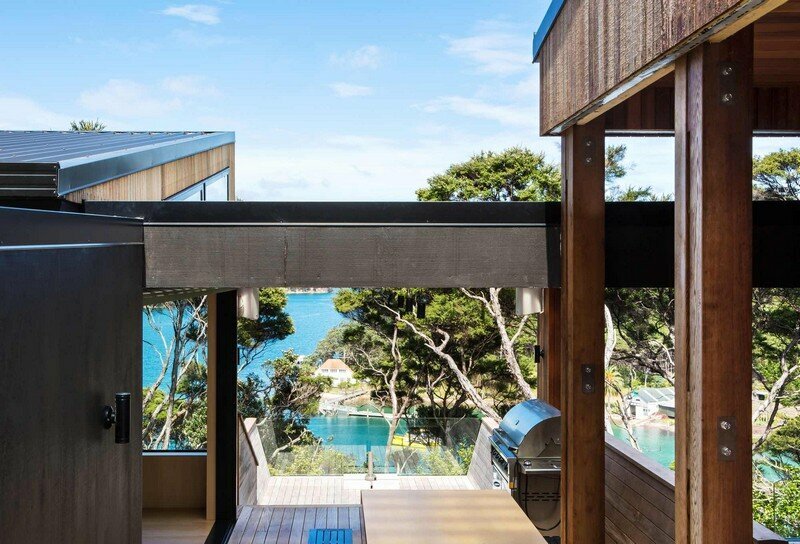 This holiday home was designed by Dorrington Atcheson Architects on Kawau Island, Hauraki Gulf, New Zealand. 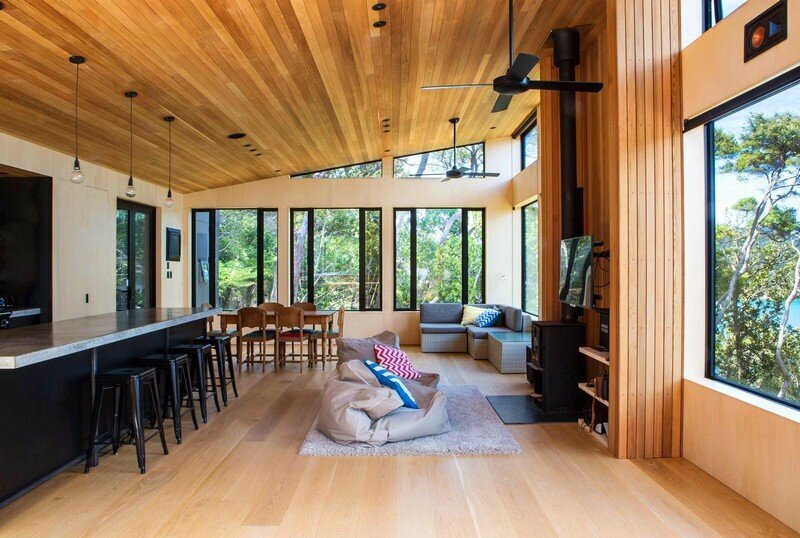 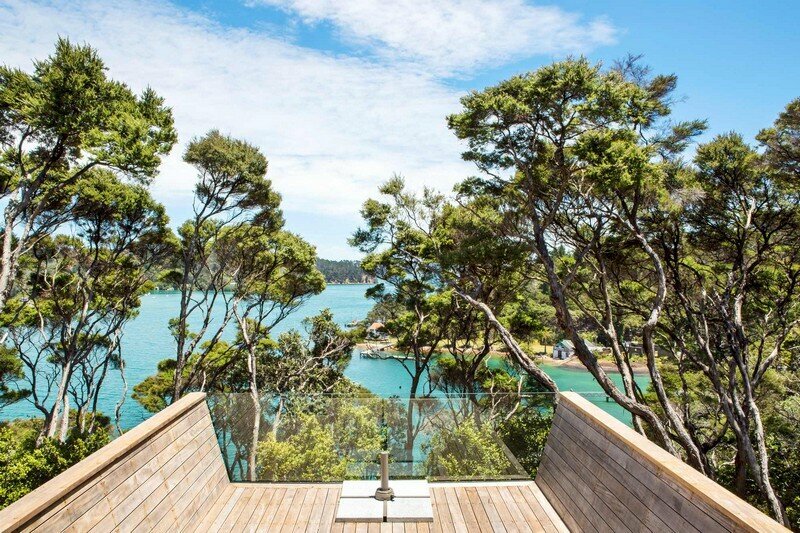 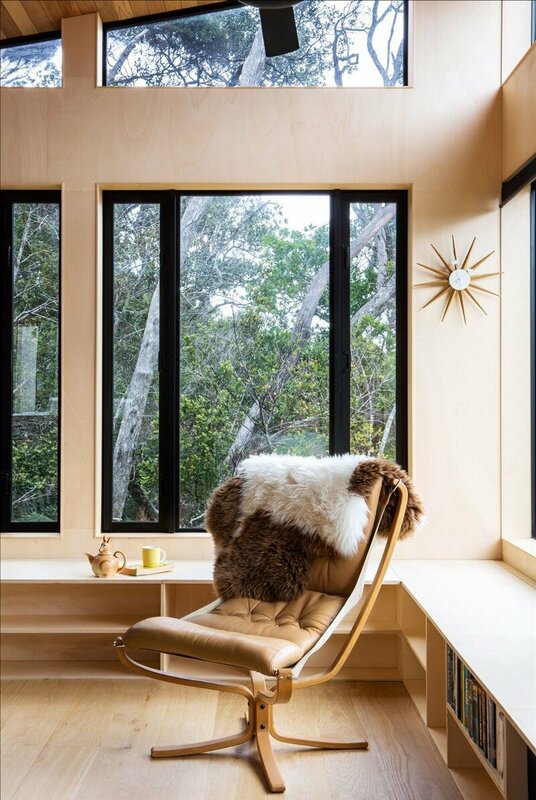 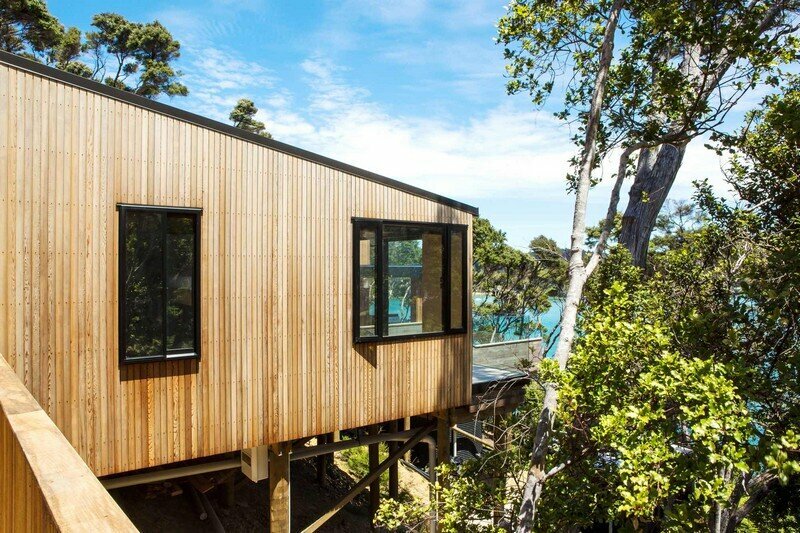 Project description: The orientation and design of this holiday home for a family of four on Kawau Island makes a hero of the view that stretches from the headland across the Bon Accord harbour and out to sea. 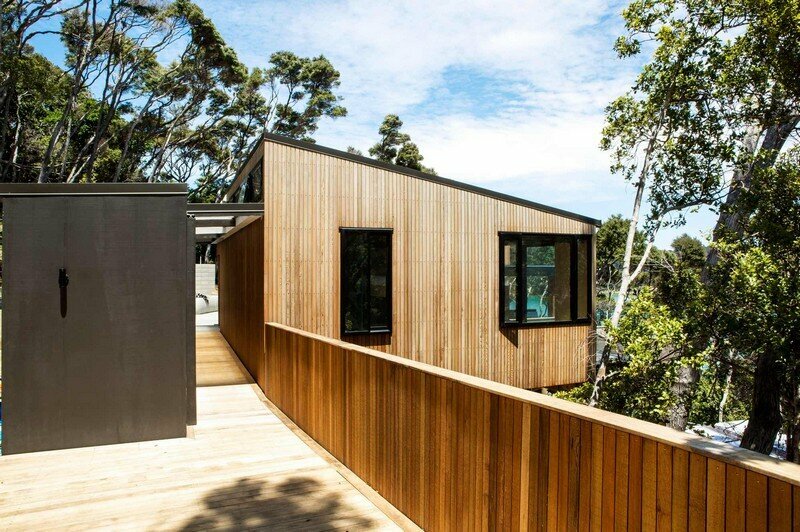 With humble scale and materiality, the form hunkers into a steep manuka-clad site, a quiet newcomer to the native forest. 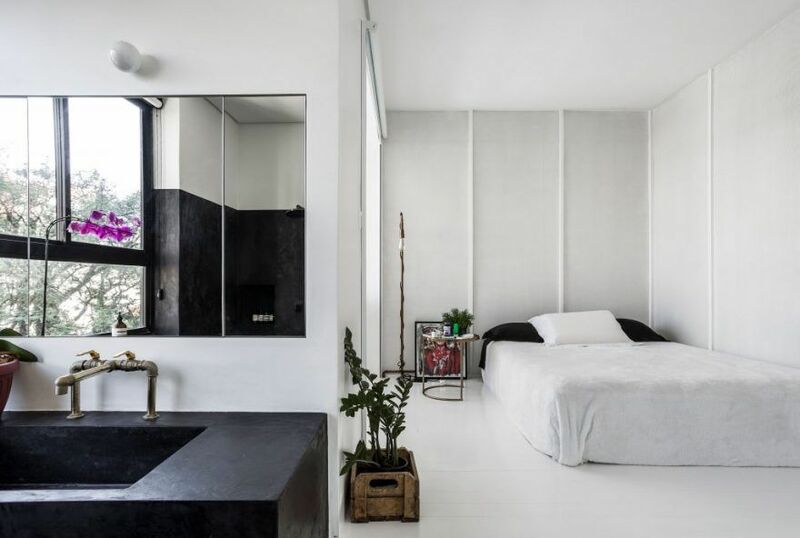 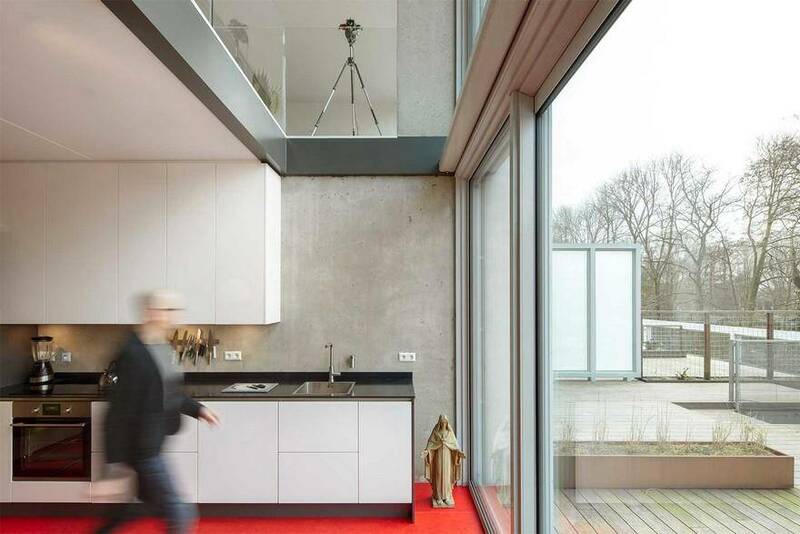 Visitors enter the house by walking between two forms: a lineal spine and the bedroom block. 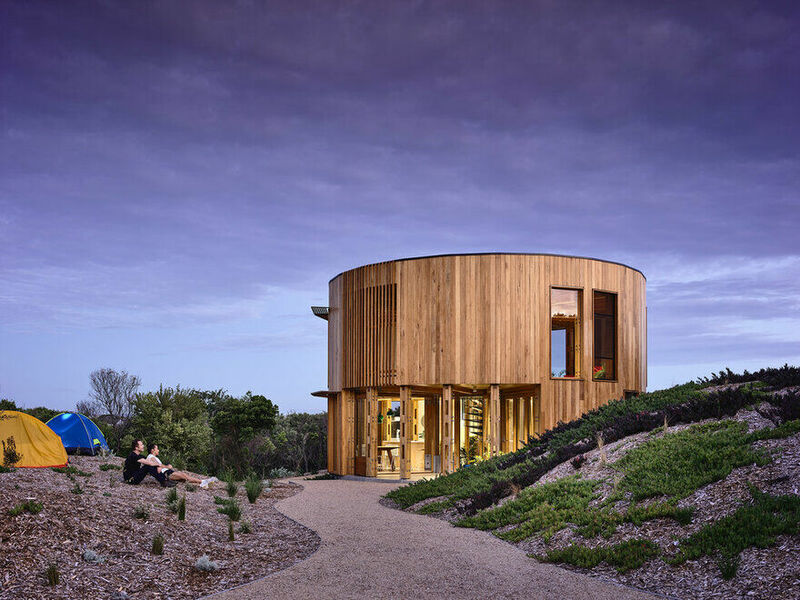 The ‘spine’ is a utilitarian area with a dive room for wetsuits and regulators, a temperature-controlled cool store, the laundry and extra storage. 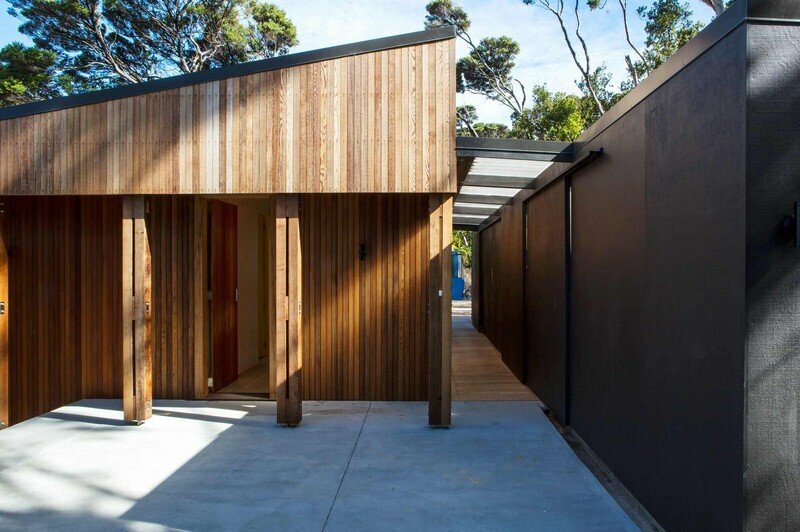 The layout of the main home comprises two unimposing elements: one pavilion becomes the social hub that contains a modest kitchen, living and dining area; the other – the sleep zone – with two bedrooms, bathrooms, and a “rack and stack” bunkroom. 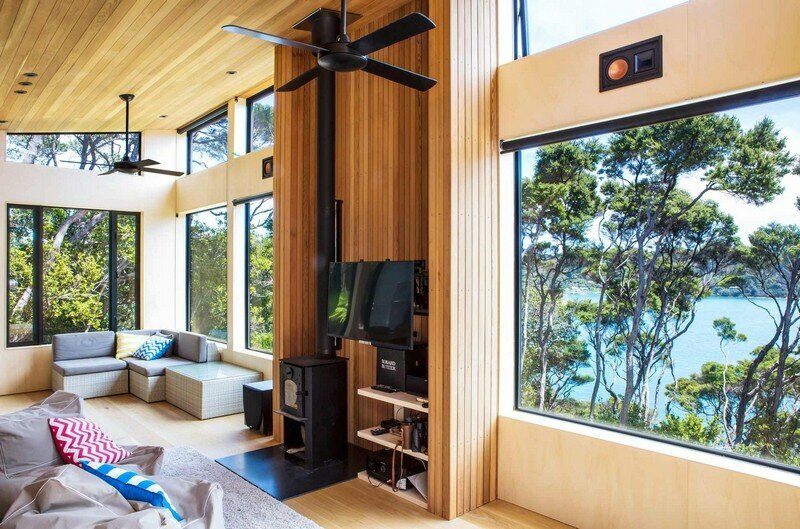 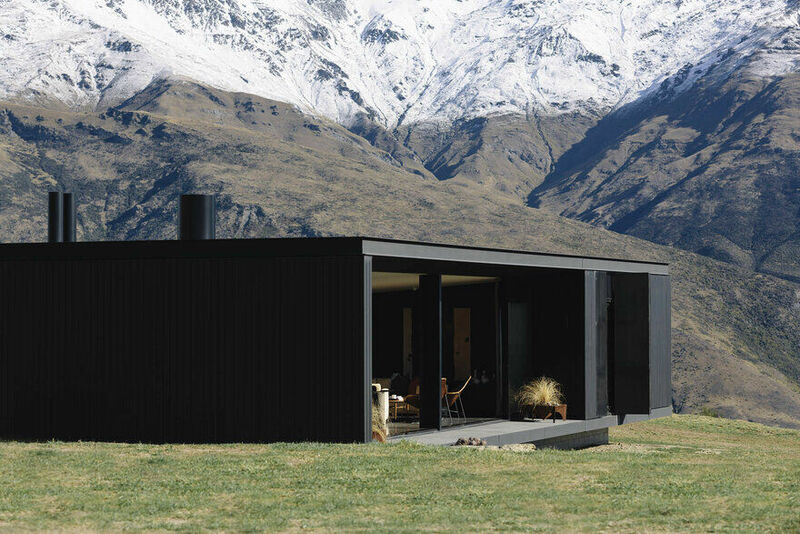 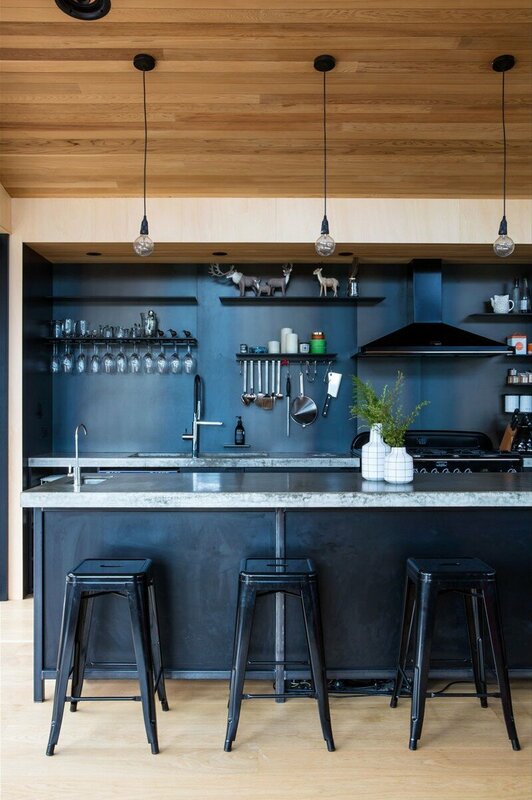 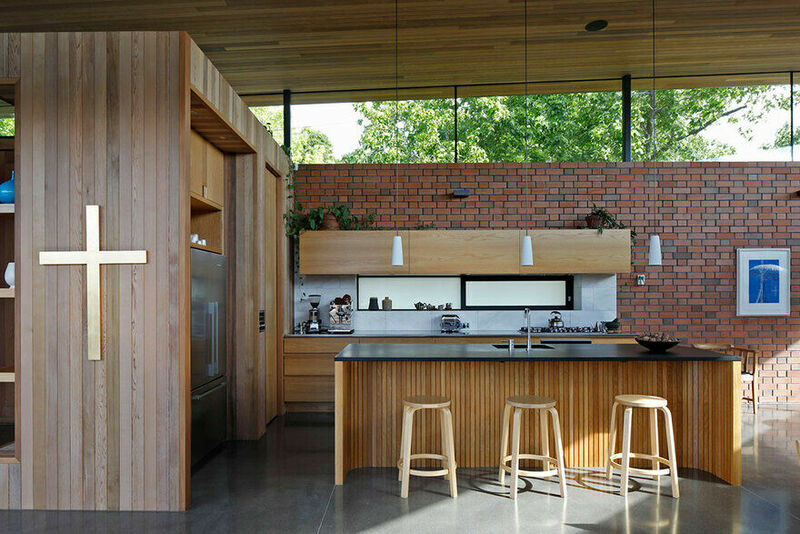 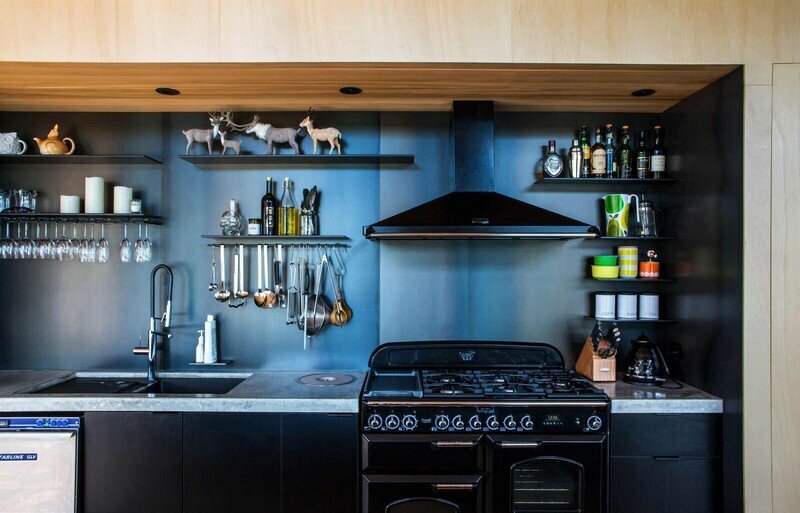 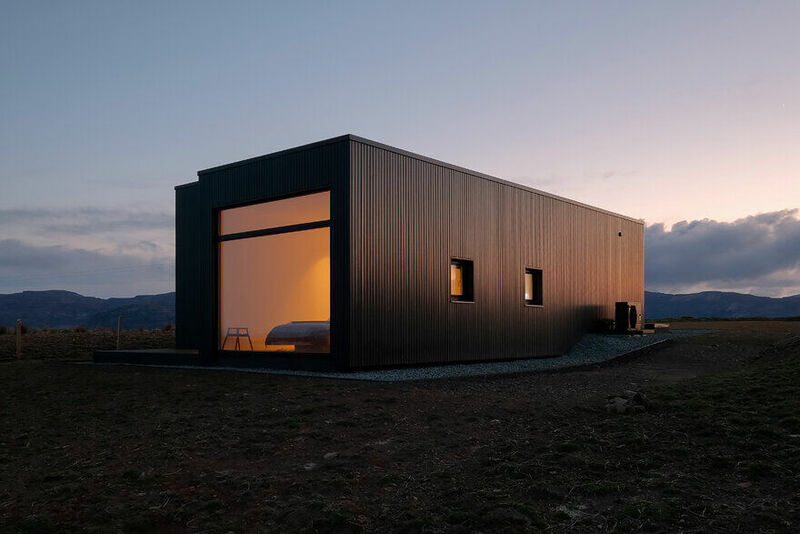 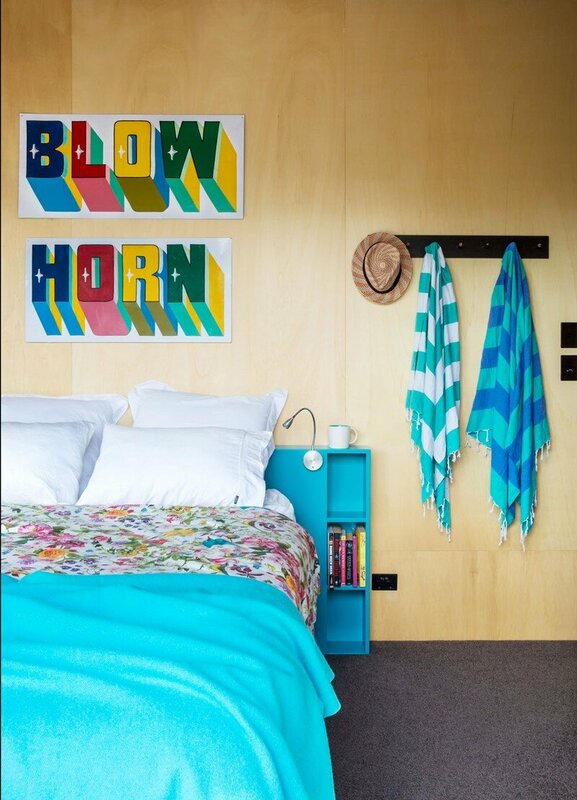 Cedar shiplap and black ply cladding speak of the Kiwi vernacular while the layout is reminiscent of a campsite, albeit with a few extra home comforts. 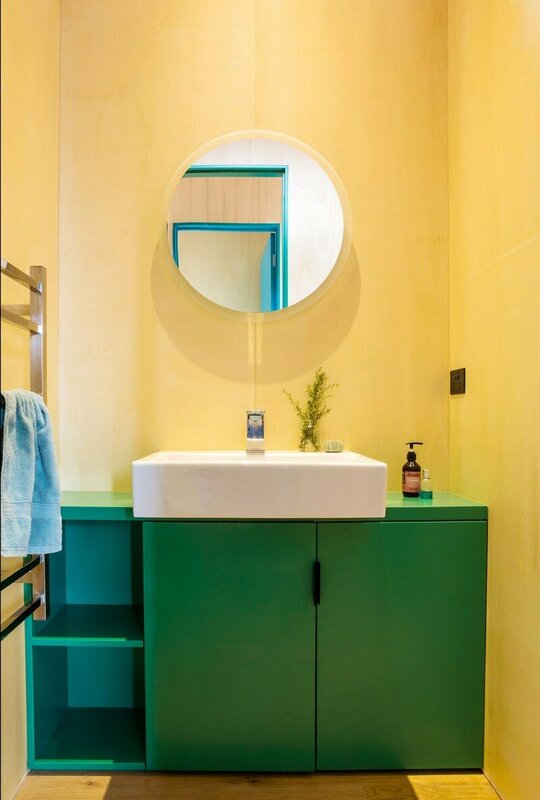 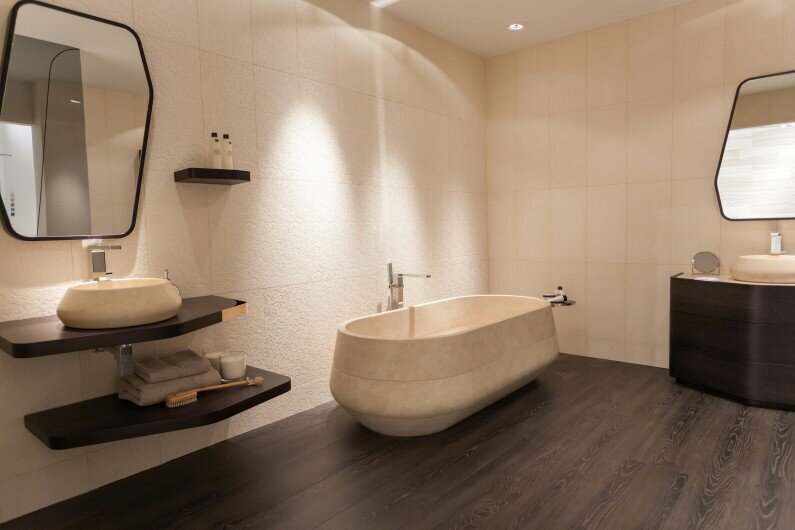 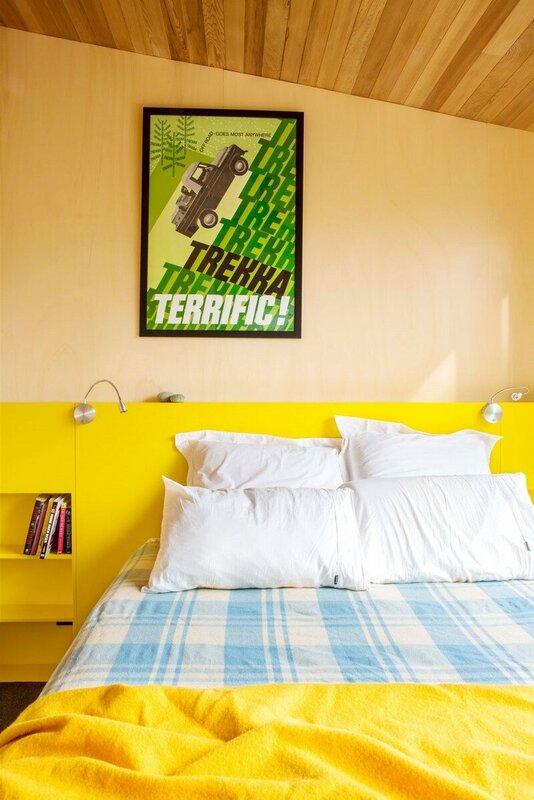 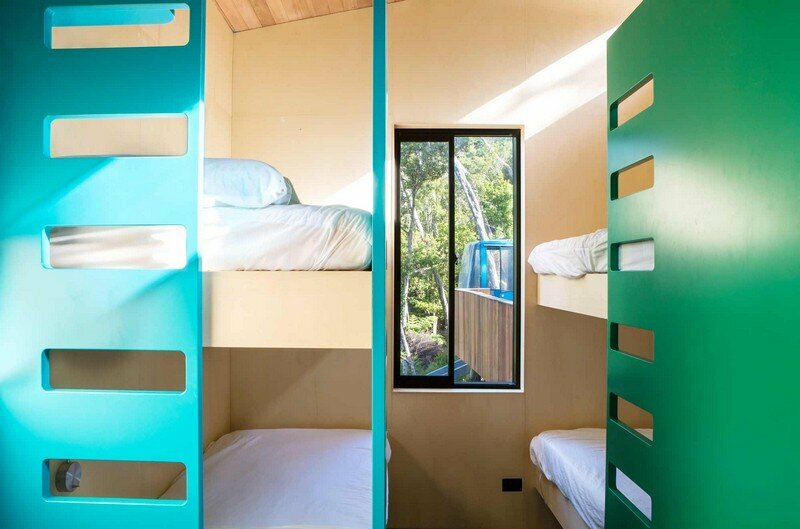 A cocoon of timber created by cedar-sarked ceilings, plywood wall linings and solid-oak overlay flooring lends the space material warmth while shots of colour in the bedrooms bring a playfulness that is important within the context of a family escape. 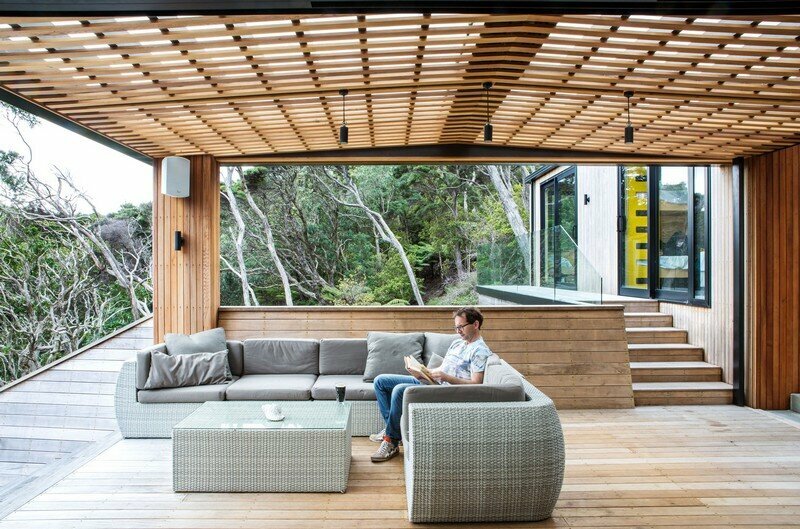 In contrast to the intimacy of the interiors, a pier-like deck becomes a pathway that celebrates the open-air environment. 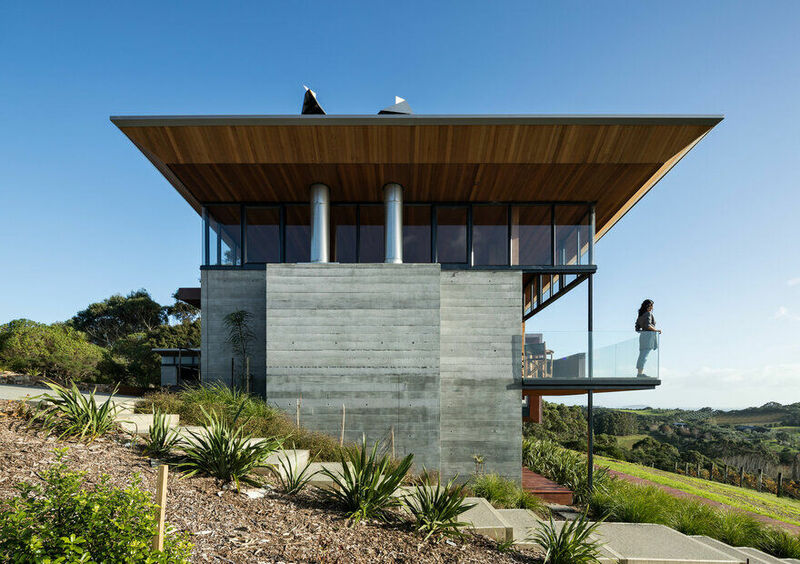 It emerges from the slope to hover above the bay. 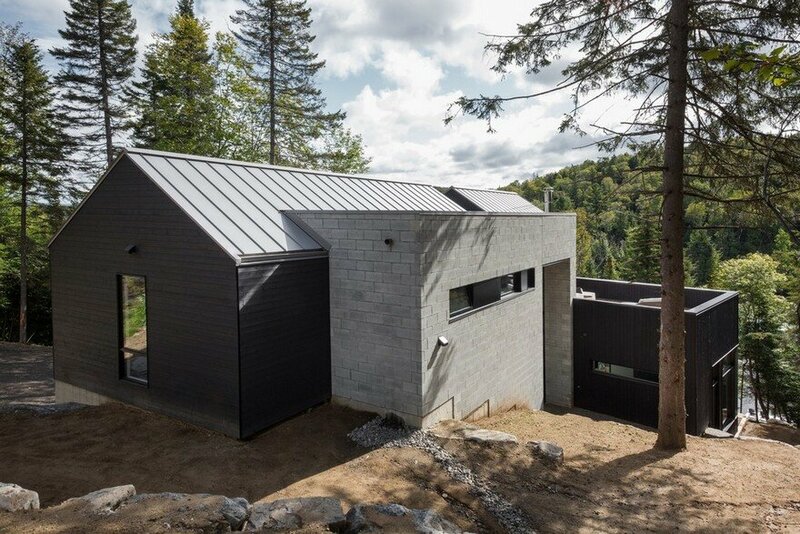 It steps down in tiers to trace the contour of the land, and projects into the view. 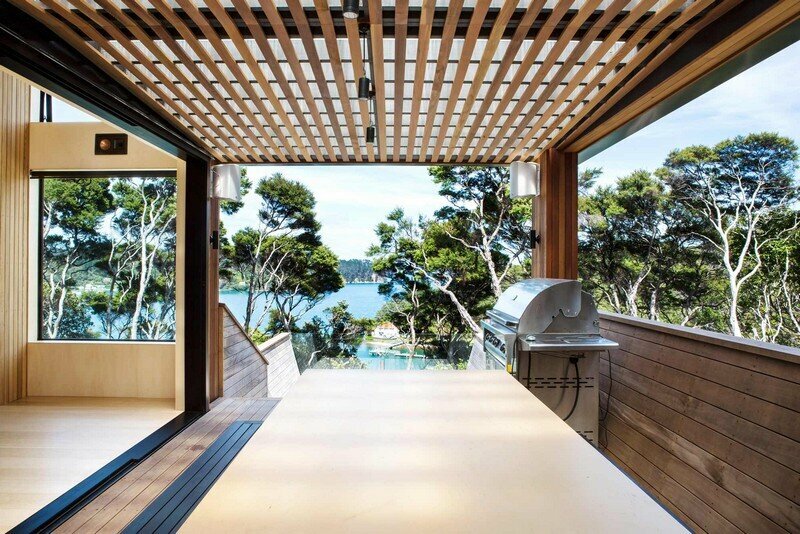 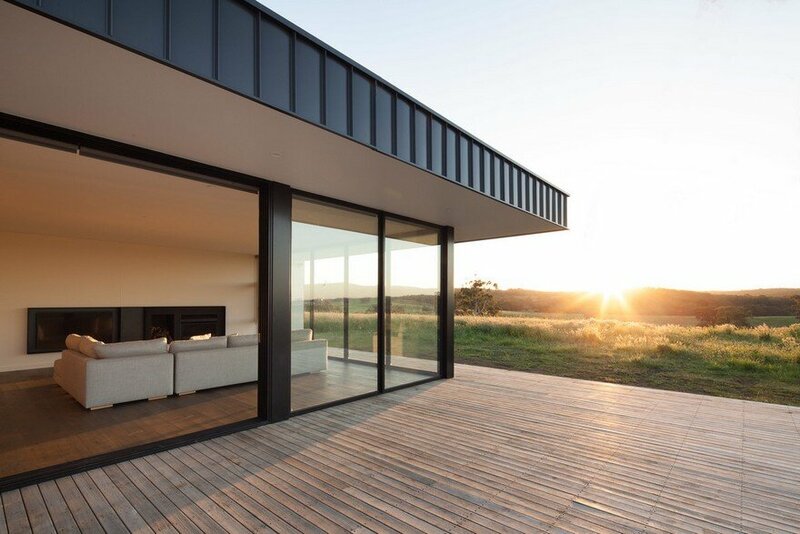 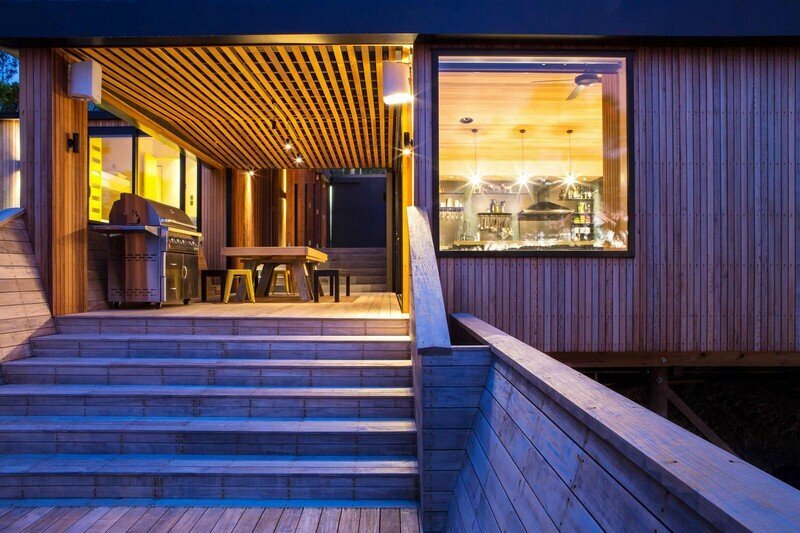 The sides of this deck wrap up, while at its end a glass balustrade frames the horizon.